SAN FRANCISCO (AP) — The European Union ordered Apple on Tuesday to pay nearly $15 billion in back taxes to Ireland, plus billions more in interest, in a move that dramatically escalates the fight over whether America's biggest corporations are paying their fair share around the world. While Apple could easily afford the bill, the tech giant said it will challenge the EU decision, which found that Ireland granted a sweetheart deal that let Apple pay almost no taxes across the European bloc for 11 years. And Ireland, which has long used low taxes to attract foreign businesses, said it will stand with Apple. "We now find ourselves in the unusual position of being ordered to retroactively pay additional taxes to a government that says we don't owe them any more than we've already paid," Apple CEO Tim Cook complained in a statement. The White House also blasted the ruling as unfair and disruptive to its own efforts at tax reform. But the decision was welcomed by groups that have long criticized the practices used by Apple and other large companies to legally reduce their tax obligations. The ruling was the latest in a series of aggressive moves by European officials to hold U.S. businesses, particularly big tech companies, accountable under the EU's rules on taxation, competition and privacy. "They're going after Apple, which means a big name and big dollars," said Brad Badertscher, a corporate tax expert at the University of Notre Dame's Mendoza College of Business. "It's a big shot across the pond to U.S. companies." California-based Apple reported over $53 billion in profit in its last fiscal year on worldwide sales of more than $233 billion. It says it paid $13 billion in corporate income taxes globally. But EU Competition Commissioner Margrethe Vestager said Ireland granted such lavish tax breaks to Apple that the company's effective corporate tax rate on its European profits dropped from 1 percent in 2003 to a mere 0.005 percent in 2014. 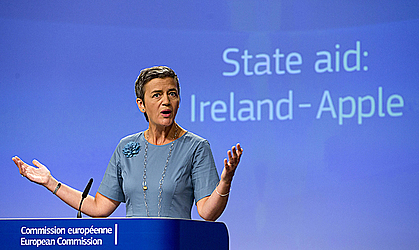 While Apple disputed her figures, Vestager argued that Ireland violated EU rules by essentially giving subsidies to selected companies. Under its current arrangement, Apple treats virtually all sales of iPhones and other goods and services in the EU's 28 nations as revenue generated by its Irish subsidiaries. Vestager ordered Ireland to recover the unpaid taxes for the years 2003 to 2014, plus interest, which one analyst said could amount to an additional 6 billion euros. For Ireland, a country of barely 4.6 million people, the sum would be a huge windfall — equivalent to over 2,800 euros ($3,150) for every man, woman and child. And yet the government said it will appeal the decision, arguing it granted no special treatment to Apple. Ireland has for years offered low corporate tax rates to multinationals, a common strategy among Europe's smaller countries, including Luxembourg and the Netherlands. Multinationals have such huge revenue that these countries can reap big gains even from low taxes. They also benefit from the jobs created. Apple has 5,500 workers in Ireland, making it one of the biggest private-sector employers. "It is important that we send a strong message that Ireland remains an attractive and stable location of choice for long-term substantive investment," said Irish Finance Minister Michael Noonan. "Apple has been in Ireland since the 1980s and employs thousands of people in Cork." Apple likewise argued that it followed the law and paid every cent of what it owed. "We are confident the commission's order will be overturned," Cook said, while also warning: "Beyond the obvious targeting of Apple, the most profound and harmful effect of this ruling will be on investment and job creation in Europe." Badertscher agreed the ruling could discourage U.S. companies from investing in Europe. But others applauded the crackdown on what they described as a "race to the bottom" by individual nations offering lower tax rates than their neighbors. "To its credit, the European Union understands that when member nations act as tax havens, as Ireland has, there are casualties far beyond the borders of Ireland," said Matthew Gardner, executive director of the Institute on Taxation and Economic Policy, a liberal research group in Washington. "It's not a good economic development strategy for Ireland in the long run, and it also subverts the tax system of every other member nation and nations around world," he added. But the EU's move risks the ire of the United States. In recent weeks, the Obama administration warned European officials that their investigations seemed to be unfairly singling out U.S. companies. U.S. Treasury officials also complained that imposing European taxes retroactively could hurt American taxpayers, since U.S. companies can receive a tax credit in this country for taxes paid overseas. Apple, along with other big U.S. multinationals, has built a vast stockpile of cash from its foreign operations, but it has left the money overseas to avoid paying U.S. taxes that it would owe if it brought that money home. The company reported this summer that it holds nearly $215 billion in cash and securities overseas, much of it generated by its Irish subsidiaries. Cook has complained that high U.S. taxes have discouraged the company from bringing those earnings home. Apple said the EU ruling will have no immediate effect on its finances. Wall Street analysts agreed, noting the potential tax bill is a small fraction of the company's cash stockpile. Apple stock declined by less than 1 percent Tuesday.